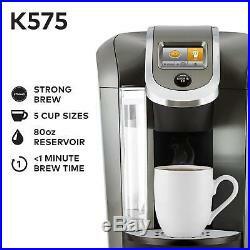 " Single Serve Coffee Maker Espresso Machine Keurig KCup Programmable 12oz Brewer". 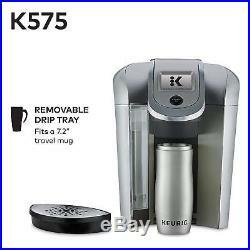 PRODUCT DESCRIPTION: Keurig K575 Single Serve Programmable K-Cup Coffee Maker with 12 oz Brew Size and Hot Water on Demand, Platinum PRODUCT FEATURES. LARGE 80oz WATER RESERVOIR: Allows you to brew 10+ cups more before having to refill, saving you time and simplifying your morning routine. The water reservoir is removable, making it easy to refill whenever you need to, and on the K575, you can choose from several different nightlight colors to illuminate your kitchen at night. 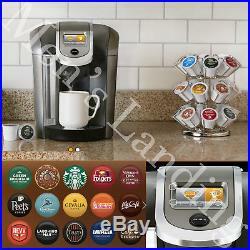 MULTIPLE K-CUP POD BREW SIZES: 4, 6, 8, 10, 12 oz. 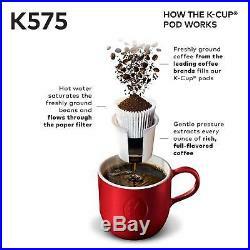 Brews a Carafe (22, 26, or 30oz) using K-Carafe pods, to give you more coffee when you need it. STRENGTH CONTROL: A strength control setting allows you to brew a bolder cup using any K-Cup pod brew size. 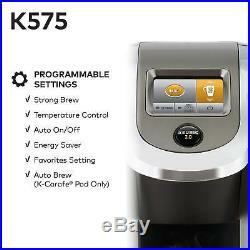 Plus, five temperature settings allow you to enjoy your favorite beverage at your desired temperature. HOT WATER ON DEMAND: Press the hot water on demand button and select your desired brew size in order to dispense hot water. 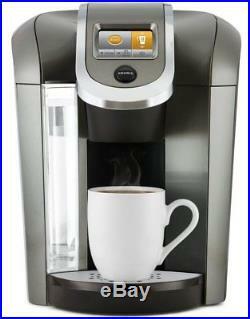 EXTRA-LARGE COLOR TOUCH SCREEN: A digital clock makes it easy to brew a fresh, great tasting cup in under a minute. Plus, program your brewer to turn on or off automatically at set times, so that it is ready to go when you want it, and turns off to conserve energy. We don't accept P.
BOXES or APO's - please provide a physical address! Be sure that we will resolve any issues in timely manner! 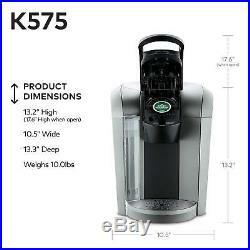 The item "Single Serve Coffee Maker Espresso Machine Keurig KCup Programmable 12oz Brewer" is in sale since Thursday, August 30, 2018. 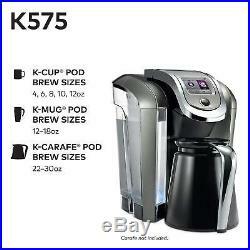 This item is in the category "Home & Garden\Kitchen, Dining & Bar\Small Kitchen Appliances\Coffee, Tea & Espresso Makers\Pod & Capsule Coffee Machines". 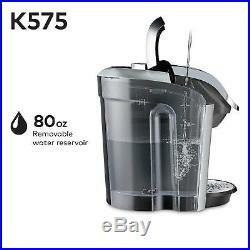 The seller is "mens_landing" and is located in Beverly Hills, California. This item can be shipped to United States, Canada, United Kingdom, Denmark, Romania, Slovakia, Bulgaria, Czech republic, Finland, Hungary, Latvia, Lithuania, Malta, Estonia, Australia, Greece, Portugal, Cyprus, Slovenia, Japan, China, Sweden, South Korea, Indonesia, Taiwan, Thailand, Belgium, France, Hong Kong, Ireland, Netherlands, Poland, Spain, Italy, Germany, Austria, Israel, Mexico, New Zealand, Philippines, Singapore, Switzerland, Norway, Saudi arabia, Ukraine, United arab emirates, Qatar, Kuwait, Bahrain, Croatia, Brazil, Chile, Colombia, Costa rica, Dominican republic, Panama, Trinidad and tobago, Guatemala, El salvador, Honduras, Jamaica.